November's update is once again somewhat different from our usual Buchschmid and Gretaux fare. 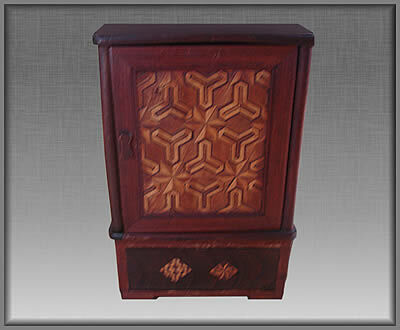 We have had an unusual Parquetry Design cabinet or box sent in which its owner believes could well be Victorian in origin. The cabinet/box is very strange in having four opening hinged doors, we wonder for what purpose? 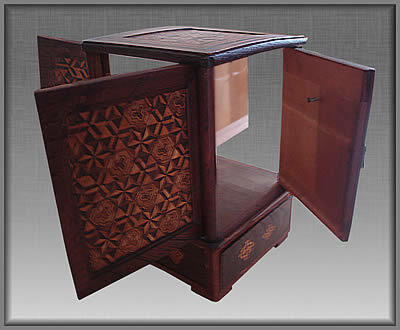 Our November 2010 update enquiry has been sent in to us by Ursula Jones who has been very fortunate in having this unusual parquetry decorated cabinet come into her possession. 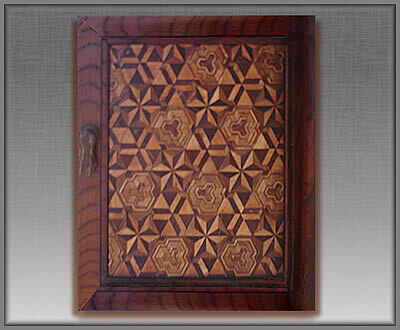 The cabinet (or box if you prefer) has four opening doors (one on each side) which are decorated with some very pleasant parquetry motifs. The cabinet / box stands roughly 12 inches in height (approx 30 cms) and appears to originate from around the Victorian period. Those, in essence, are the known or assumed facts with this interesting cabinet - but, what Ursula and ourselves would really like to know is: "Just what is this cabinet / box actually designed to do?" If you know what its original purpose is, do please let us know as we are somewhat stumped with this one! We think it may have something to do with a large travelling or carraige clock, but this is pure conjecture. It is probably something more prosaic than that. Why would you want or need a door to open on each of the four sides? We could understand a front and a rear door, but the sides as well - it seems odd doesn't it? Each of the doors has a handle for opening its own respective door; so, clearly each of those doors is meant to reveal something reasonably significant, we are sure you will agree with that, but once again, it begs the question - what? If you do know what this is, please help put our poor old tired minds at rest and educate us, thanks! Click the above button to return to page 29 of "Can You Help"